In Australia criticism of Islam is equated to "pro-Israel" as if one is a corollary of the other. Criticising intolerance is claimed as being intolerant oneself; and criticism of the calls for doctrinal violence is turned into an accusation that the critic is advocating the violence that they condemn. Adolf Hitler used a similar ploy in Mein Kampf in which he decried a "Jewish plot" to take over the world - when the Jews had no such "plot" - but at the same time declaring that territorial expansion of Germany was a German right that Germans would pursue by force-of-arms. Obviously the tactic of condemning your adversary for pursuing a line of action that you, and not they, pursue, still works! 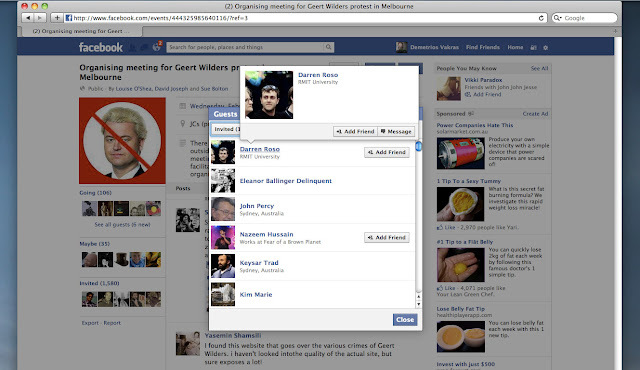 In early 2013 Geert Wilders came to lecture in Melbourne Australia. His criticism of Islam drew protests from the political left and Pro-Palestinian groups who associated criticism of Islam to being "pro-Zionist" and "racist". 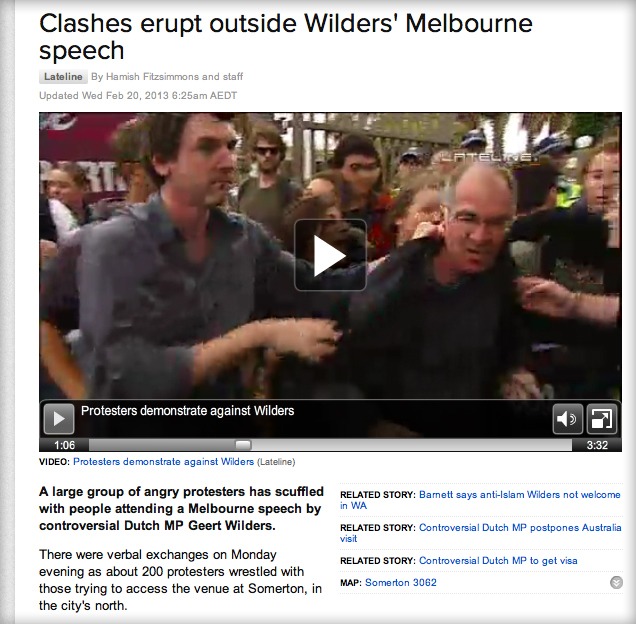 The pro-Palestinian left protestors physically attacked those who came to hear Geert Wilders speak. Above. Still from Australia's ABC TV video. 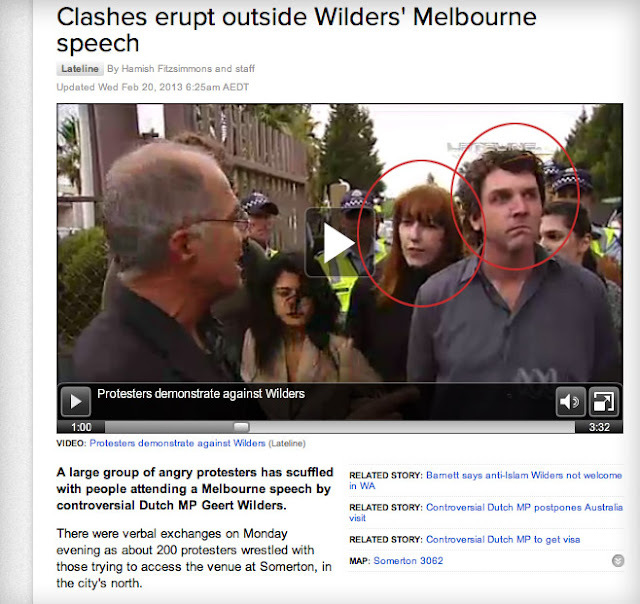 One of the anti-Wilders protestors, Anthony Main, former City of Yarra councillor and Yarra Socialist candidate grabs an attendee who is attempting to enter the Wilders lecture. This attendee is thrown to the ground by Anthony Main. Protests were organised against Wilders' criticism of Islam. The claim made was that he is racist to criticise Islam and that it is racist to criticise the deeds done by Muslims who follow those doctrines that are criticised. The group who organised the protest against Wilders were a pro-Palestinian group. This pro-Palestinian group claim that criticism of Islam equates to being pro Israel, and that this is racist. At my exhibition opening in 2009 part of my exhibition included criticism of religious values. Criticism was made of the doctrinal elements of Judaism, Christianity, Islam and Zoroastrianism. This was publicly and loudly declared "racist" by the gallery owner Robert Cripps because my criticism included criticism of Islam. Cripps claimed that criticism of Islam was racist because it affects who an observer would perceive to be the victim and who they would perceive to be the aggressor in "Palestine", even though "Palestine" was not referenced anywhere in the exhibition. Cripps claimed that Muslims were the victims of Jews. By exposing Islam's doctrinal sources it could be shown that the conflict in "Palestine" is a religious war declared unilaterally by Islam and waged by Muslims based on hatreds which are integral to Islamic doctrine. These doctrinal elements are fundamental to the charters of the PLO and the Hamas Covenant which cite them and, in the instance of Hamas, which cites doctrine (the Koran) as their constitution. "Palestinians" can be allowed to wage a religious war with impunity only for as long as the doctrinal basis for this war is off limits for discussion and analysis. Why "Palestine" would arise in the absence of mention of the conflict in "Palestine" in the exhibition has caused me an apparent difficulty, even though the necessity by Muslims to keep doctrine from becoming known is itself self-evident. I apparently have to explain this. 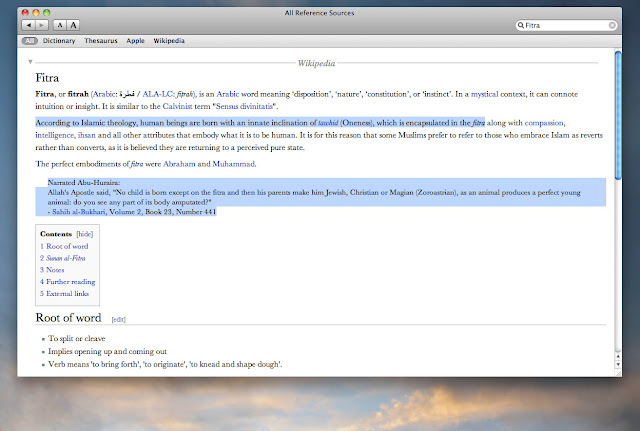 Reference to Islamic doctrine can be limited in a number of ways, including calling the critic "racist". This state's notorious Religious Vilification Act, or "defamation of religion" laws, have in the past been used to achieve this aim. The protest against Wilders was set up on Facebook. 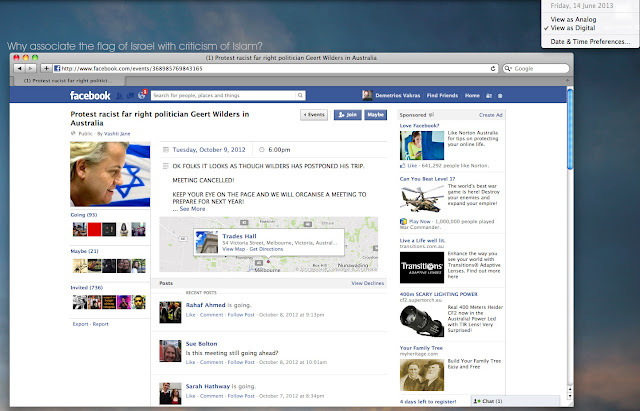 One of the associates of the protest proclaimed that the intention of protest was so that Wilders would only be comfortable to lecture in Israel. The claim: Israel is racist and is the only country that would have no problem with criticism of Islam. Above a Miriyam Asfar. 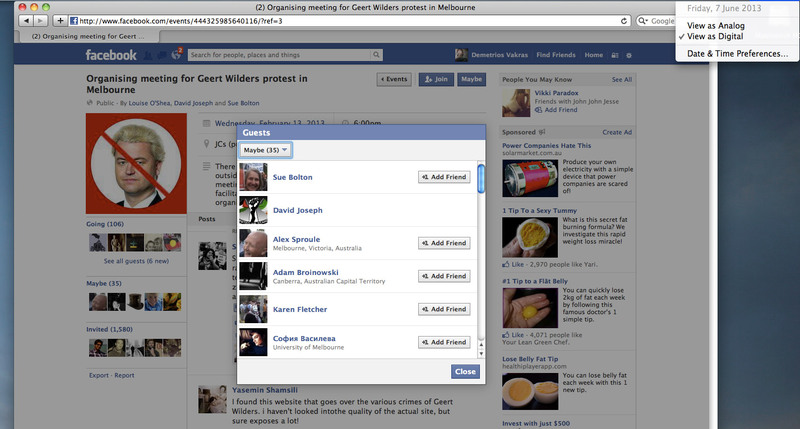 Screenshot of the discussions on Facebook organising a protest against Wilders. Asfar associates Wilders' criticism of Islamic doctrine with something that Israel alone would support. Though criticising Islam has no relationship with Israel, critics of Islam are attacked as "pro-Israel" by pro-Palestinian groups ( http://www.facebook.com/events/444325985640116/?ref=3 ). Sawsan Hassan, above, commenting on the organising of the meeting to protest Wilders' lecture critical of Islam. Here criticism of Islam is claimed to be “Pro Zionist”, and “racist”. According to this Zionism is racism and only Zionists critique Islam, and anyone who critiques Islam is therfore a Zionist and racist ( http://www.facebook.com/events/444325985640116/?ref=3 ). 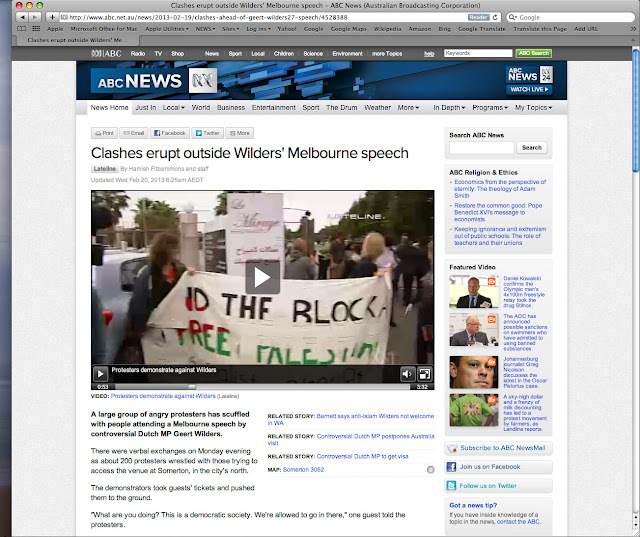 When organising an earlier anti-Geert Wilders protest in Melbourne, Wilders was associated with Israel; his profile is juxtaposed against an Israeli flag in the background. The protest against Wilders included calls to "end the blockade" and to "free Palestine". On what rational grounds is criticism of Islam a corollary to supporting a blockade? and what has it to do with the “Palestine” issue? The protest against Wilders was organised by Students for Palestine and supported by Leftist organisation such as the Socialist Alternative. Those who protested against Wilders were “left-wing”, and anti-Israel. 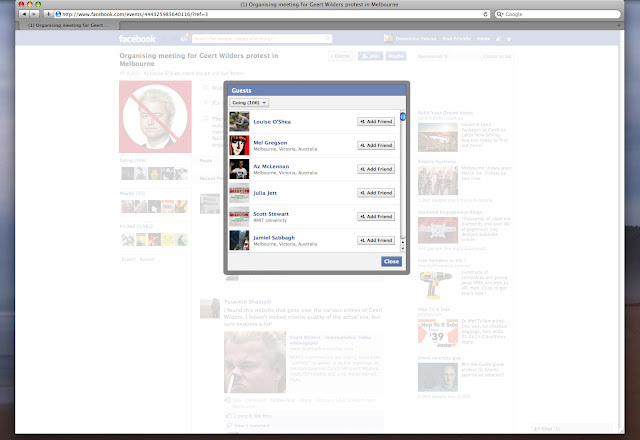 Below, a screenshot of those confirming their intention to protest on Facebook. Confirming her attendance is Mel Gregson, Yarra Socialist candidate. The page organising the protest is made public by Sue Bolton (which can be seen in the earlier screenshot) who is a socialist councillor and is listed as “maybe” attending. 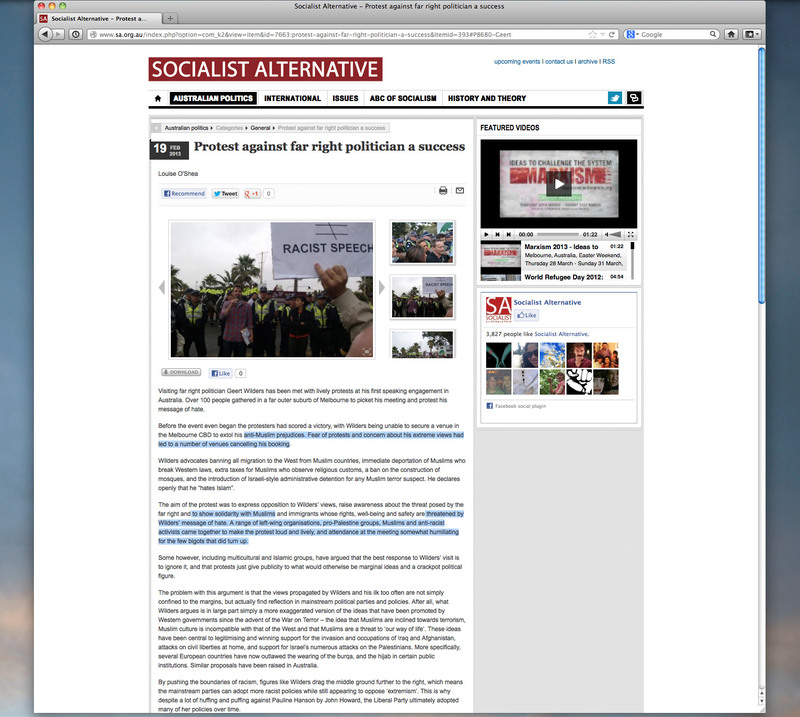 Also listed is Azlan ( Az ) McLennan who has previously campaigned against Israel. 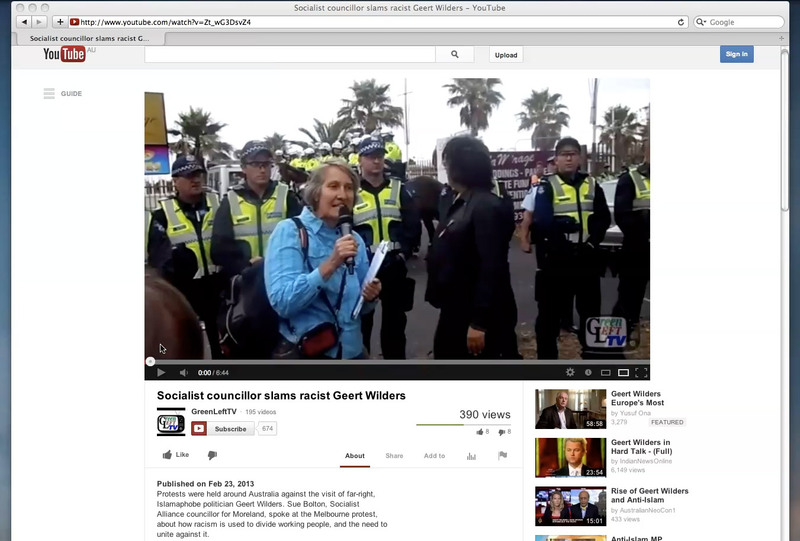 Above, Mel Gregson and Anthony Main, both from the Yarra Socialists. 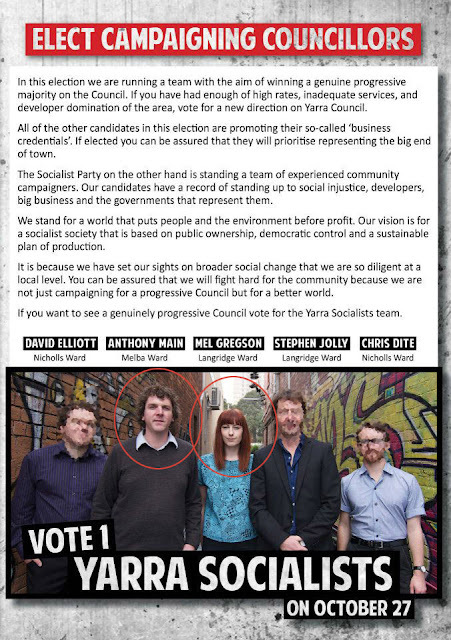 Below, the Yarra Socialists how-to-vote card for the council election 4 months earlier. In the ABC (Australia) video (former) City of Yarra councillor, Anthony Main can be seen at the 32 sec. 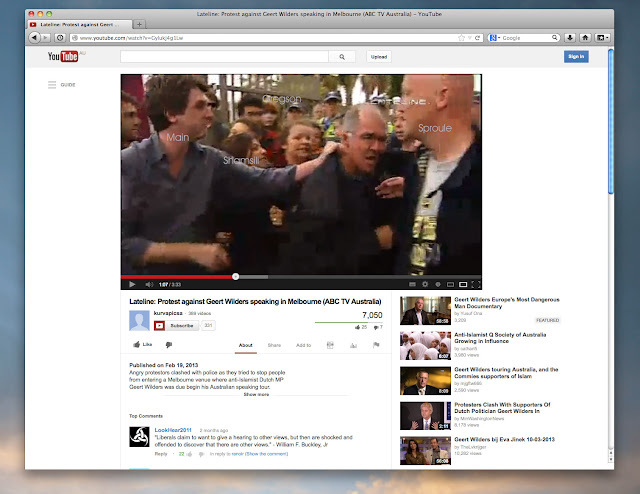 mark manhandling an attendee; and at the 1:06 - 1:16 mark Anthony Main physically throws an attendee to the ground! 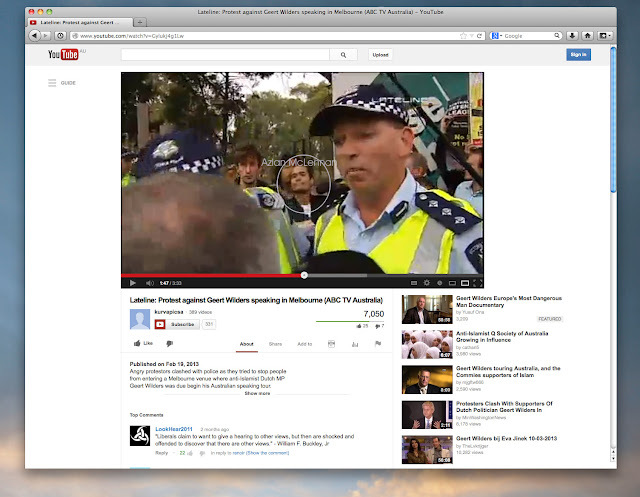 Beside Main is Alex Sproule who assists Main in throwing an attendee to the Wilders lecture to the ground. 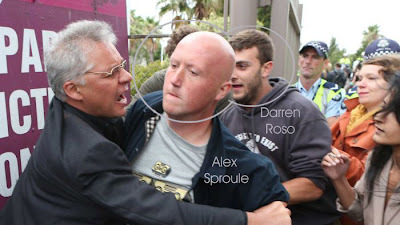 It is Sproule who is place in a headlock by police and removed. 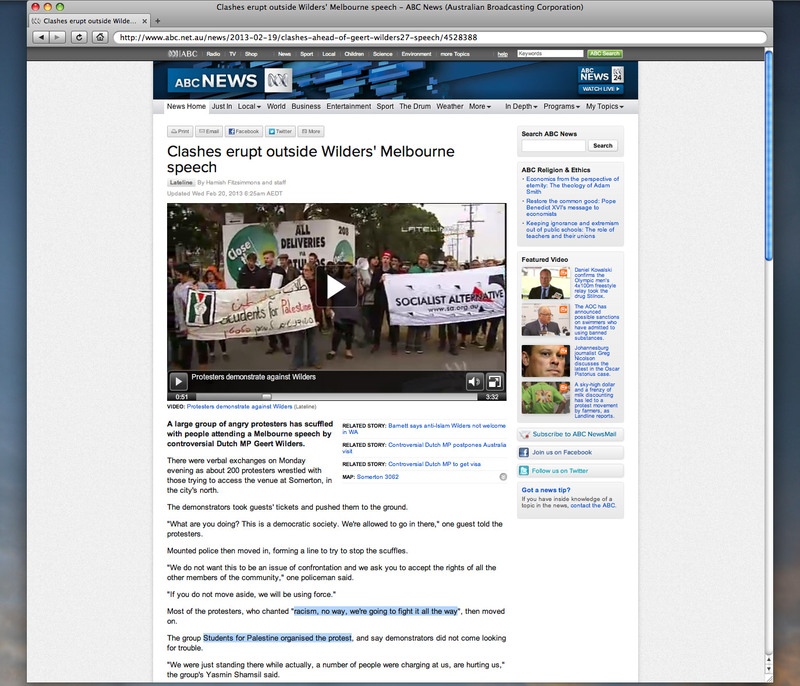 However, it was not these protestors who were accused of violence, but the people against whom violence was meted! Beside Anthony Main is another Yarra Council candidate (no.2 on the Yarra socialist's election ticket) Mel Gregson. 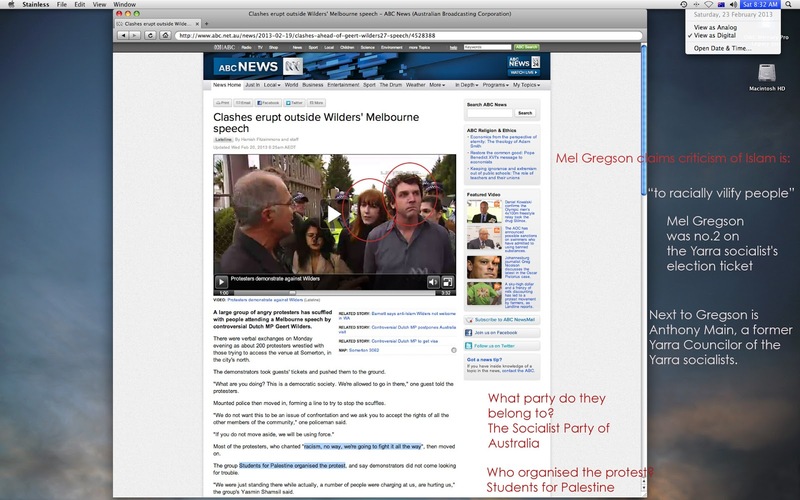 According to Mel Gregson, criticising Islam is to "racially vilify people". Somehow, to criticise religion, to criticise a doctrine that is without colour, and without race, is to have criticised a race. Comment 1 on Mel Gregson claim: "To Racially Vilify People"
Gregson's accusation that the criticism of a doctrine that has no race constitutes the vilification of those who hold the tenets of doctrine to be true, is a common one. 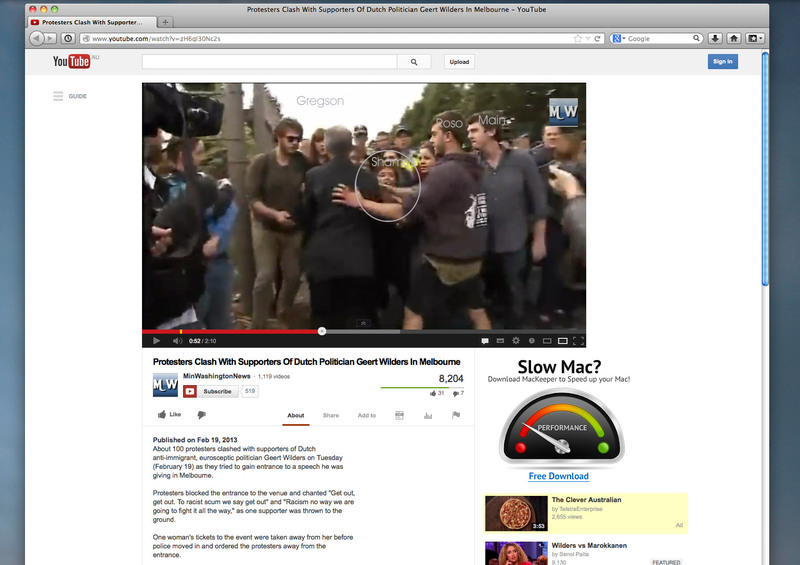 As was the finding in the 2006 Appeal to the Supreme Court of Victoria in the "Catch the Fire" case, judges Nettle et al concluded that the concept of claiming to be vilified because an idea they hold is criticised by another, would end in the shutting down of the ability to criticise any idea at all. There would in effect be no right to the criticism of any ideas, or the expression of any ideas lest they cause any person holding a contradictory idea offence or embarrassment. To use an example; had Charles Darwin been subject to such a rule he would have been guilty of vilifying Christians; evolution demonstrated that the Christians were not made in the image of God and they may have been insulted by being reduced to being mere animals, and this would have caused them offence; or they may have been embarrassed for being suggestible enough to have accepted the Biblical account as true. Comment 2 on Mel Gregson claim: "To Racially Vilify People"
I suspect that Gregson is not Muslim, so it makes it surprising that she would proclaim the Islamic mantra that all people are born Muslim which makes it a "racial" characteristic of theirs to be Muslim; meaning that religion is claimed to be something that we are all born with. Islam's position is contrary to the long-running Christian debate on whether an unbaptised baby dies a sinner if it dies unbaptised as we are born with no faith. Gregson must have been availed some insight regarding the hereditary "religion characteristic" and the mechanism by which this hereditary trait can be passed on and inherited (without it needing to be introduced or taught to the child by the parent or guardian). Hopefully she can one day enlighten us on this. In Islam every individual is born Muslim (hadith). And according to Islam we cannot be "compelled" to another religion (Koran & hadith). According to Islam being baptised constitutes "compulsion", that is: a third party (parent/priest) has declared us to be of a religion that we are not. 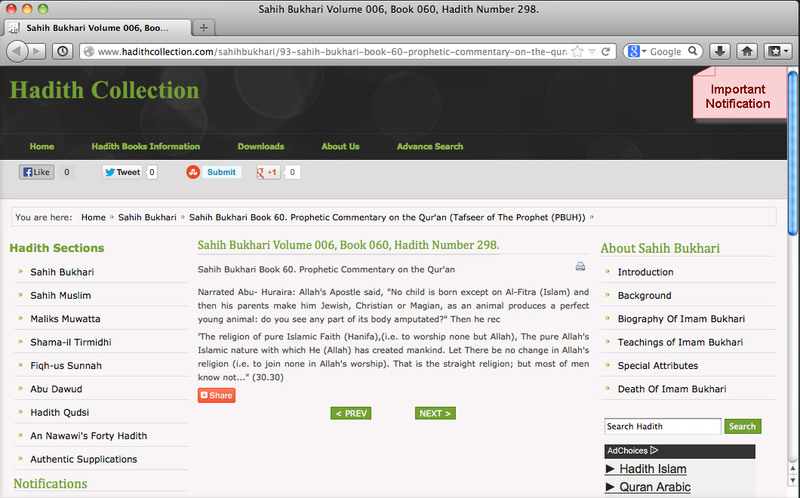 Above, one of the hadith that proclaim we are all born Muslim. This particular hadith is “tafsir”, a gloss to a Koranic verse that explains its meaning. The hadith claiming that we are all born Muslim appears on the Wikpedia definition for “fitra”; being our uncorrupted state/condition that we are all born with. As Islam claims this is a characteristic that we are born with, the corollary becomes a claim that it is racist to criticise a biological component which like the colour of our eyes, or hair, or skin, we have no say. I do wonder though; why, despite being born Muslim, do Muslims have to learn the Koran? shouldn't they be born with it? Azlan McLennan. 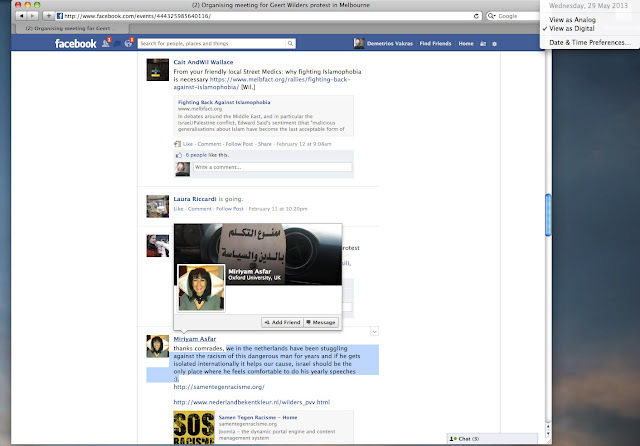 Az McLennan confirmed on Facebook that he was going (earlier screenshot). 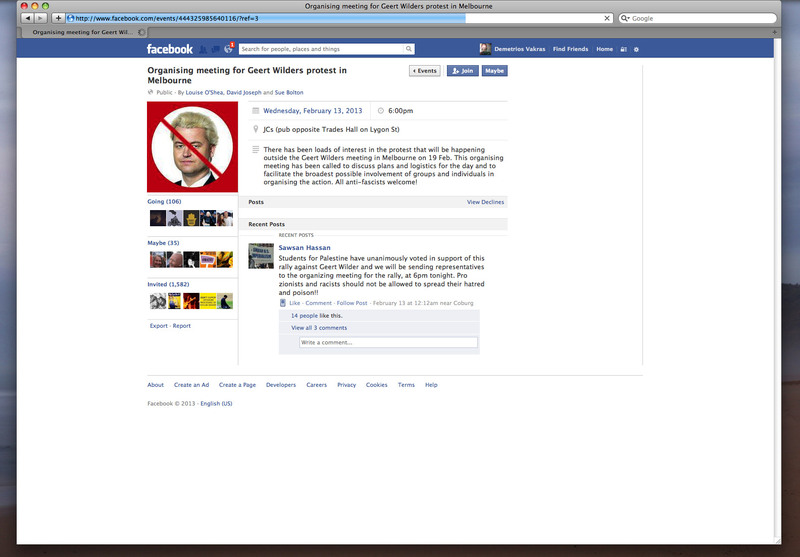 Az McLennan has previously campaigned against Israel using principles on how to conduct a successful propaganda campaign as was articulated in Mein Kampf by Adolf Hitler (nazi melbourne http://www.vakras.com/nazi-melbourne.html :"The function of propaganda... [is] that everyone will be convinced that the fact is real, the process necessary, the necessity correct, etc." "All propaganda must be popular and its intellectual level must be adjusted to. Consequently, the greater the mass it is intended to reach, the lower the purely intellectual level will have to be. "(3) "Its task is not to make an objective study of the truth... its task is to serve our own right, always and unflinchingly."p. 166, Mein Kampf. 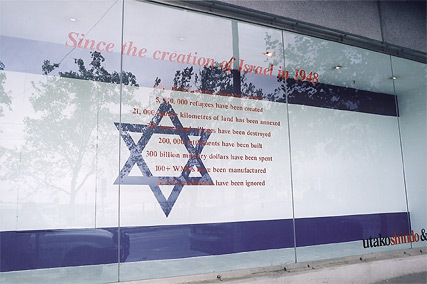 Azlan McLennan's anti-Israel propaganda piece as photographed by myself in 2004 before it was closed down. Sue Bolton. Sue Bolton making her speech which is posted on Youtube. Darren Roso, Alex Sproule, above. Below, Darren Roso invited, but did not confirm attendance on Facebook. The question recurs: why does criticism of Islam bring out those who promote “Palestine” as an Israeli atrocity ? Why does criticism of Islam mean that "Palestine" has to be raised?